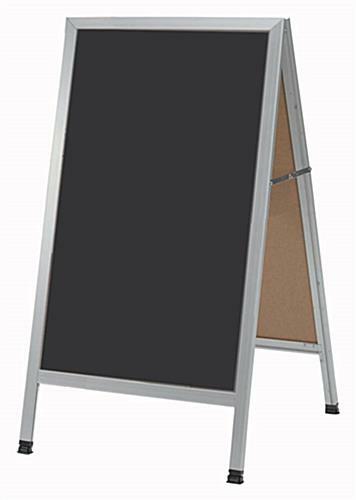 This sidewalk chalk sign is a folding a-frame designed to garner the attention of passersby. 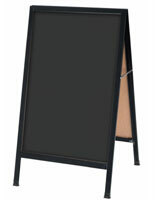 Double-sided, the display boasts a black writing surface with silver aluminum frame. The sidewalk chalk sign also comes with a box of stick chalk and eraser, so you won't need to worry about those secondary purchases. 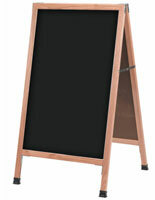 Place the sign outside your place of business, whether it's a cafe, restaurant, bakery, or coffeehouse. 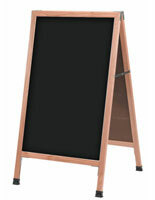 Our sidewalk chalk sign is quality made for years of service.